Spike Lee‘s BlacKkKlansman has already been making waves at the Cannes Film Festival, coming away from its premiere with glowing reviews and rumblings for a possible Palm d’Or award. The film tells the true story of Ron Stallworth (John David Washington), the first African-American detective in the Colorado Springs Police Department. Taking place during the 1970s, Stallworth infiltrates the Klu Klux Klan to make a name for himself and take down its nefarious members. 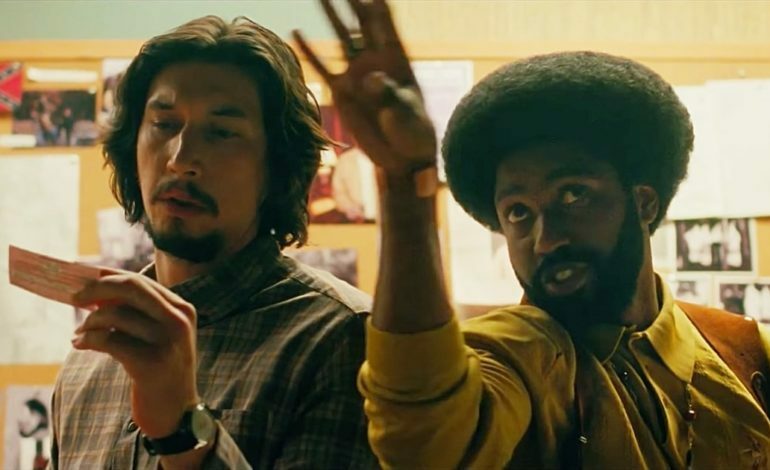 He recruits his more seasoned colleague, Flip Zimmerman (Adam Driver), to go undercover with him and expose the organization that is trying to take hold of the local racial rhetoric and take their hate crimes to the mainstream. The producers behind last year’s Oscar-winner Get Out, have teamed up with Lee for this momentous film. Spider-Man: Homecoming‘s Laura Harrier and Topher Grace also star. Check out the film’s first teaser art below, which doesn’t hold back in sending a bold and shockingly contemporary message to its viewers. BlacKkKlansman hits theaters on August 10.